Aside from the huge Galaxy J Max, Samsung also made the Galaxy J2 2016 official. It now features a bigger screen size and minor improvements in specs against the older J2. It also now has new several gimmicks that could be useful for most. The Galaxy J2 2015 boast a bigger 5 inch HD AMOLED screen with 294 ppi, 1.5 GB RAM, 2,600 mAh of battery capacity, 8 MP main camera and 5 MP selfie camera. However, it still has a small 8 GB of internal storage, and now uses a weaker 1.5 GHz SC8830 quad core processor and Mali 400 GPU setup. Related: Samsung Galaxy J2 2016 Now Available In PH Thru Intogadgets, Priced At 6990 Pesos! 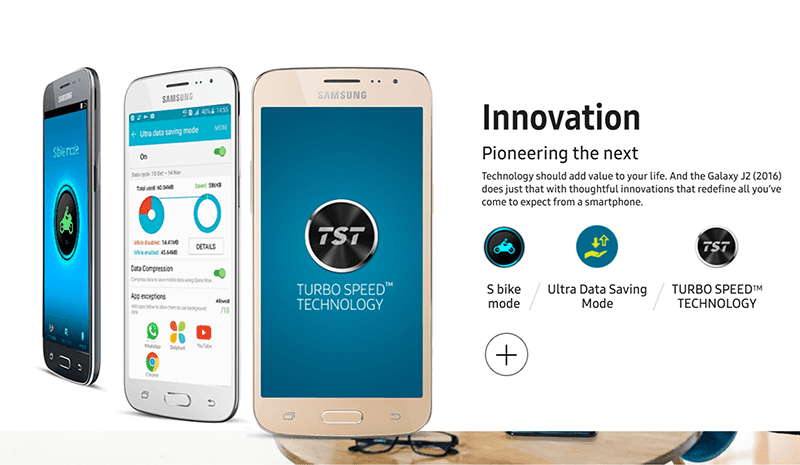 Fortunately, the Galaxy J2 2016 highlights several new features that includes the "Smart Glow" notifications with multiple colors that can be customized per alert and notification and the "Turbo Speed" technology that makes apps lighter and more optimized. You'll also get the Ultra Data Saving Mode, S Bike Mode, and a new type of UI that's should be lighter and smoother. In India, it's priced at INR 9,750 which is around 7K in Philippine Peso without tax and duties yet. There's no word though about its international availability yet.